Visit our great Gift Shop with hundreds of unique gifts. Munising Snowmobile Rentals - Also located in Grand Marais Michigan! Come and experience our unique establishment. Upon entering the Dogpatch - you are sure to have a great time. The exterior and interiors are fun and colorful while the food is "scrumshus". We're fetchin up scrumptious Vittles from the early mornin' sunrise, and when the days half thru - till the sun goes down on the mountain - this here's the place for 'lishus "Country Fixins!" 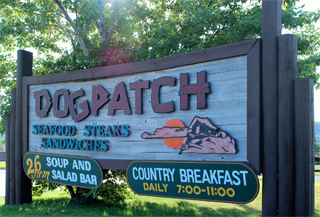 After touring our Gateway to the Pictured Rocks National Lakeshore - be sure to stop in at the Dogpatch to relax and eat from our huge selection of great dishes. Great salad bar and soups daily! Appetizers, salads, soups, charburgers, sandwiches, Famous Prime 'N Choice Charbroiled Steaks, Pizza, Chicken, Fish Dinners, and many Sweet Endings! We are famous for our Seafood and Steaks - stop by and see why so many have chosen Dogpatch Restaurant! Golden filets, deliciously tender and natural, deep fried to light golden perfection. Your fish is expertly filleted, and carefully prepared for frying with a highly-prized, taste-proven recipe...that we are sure you will enjoy immensely. 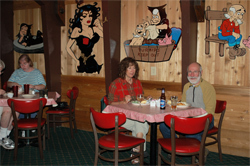 We look forward to your visit to the Dogpatch Restaurant of Munising! 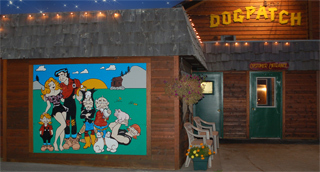 © Copyright 2006 The Dogpatch Restaurant. All images, logos, web pages in part or in whole may not be used in any way without the written consent of The Dogpatch Restaurant. Velvet Green Creations Web Design invites you to explore our services - Website Design, Flash Animation, & more! Click here for our>>Featured Web Sites.